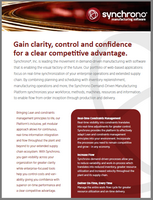 Synchrono® is an energetic, growing company on the move. As a leader in the development of demand-driven manufacturing software, we are proud to provide solutions that help our customers efficiently manage their operations, improve their margins and grow their business. You’ll be empowered to do your best work to benefit both our customers and your career. If you’re a forward-thinker who would thrive in an environment that encourages creativity, initiative and team collaboration, we’d like to hear from you. At Synchrono, your input is valued. Here, everyone plays a vital role in bringing the best solutions to our customers. In exchange, we offer comprehensive benefits in a flexible work environment. Interested in a Synchrono job opening? Submit your resume. No current opportunities. Please check back.